Too Tight, Benito! by Janeen Brian (Little Hare, 2008) is a charming picture book for two to share, cuddled up in a snug place just like its main character wants to be. You see, Benito Bear has a problem - it's nearly time for his winter sleep and he can no longer fit all the way inside his cubby-hole. So Benito goes on a search for a new cubby-hole. He finds other animal homes, but rejects them, heading deeper into the forest until he finds a deep, dark hole. Darkness where things might slither. Darkness where things might hiss. Darkness where things might flap or snap or snarl. The visual sub text adds another layer to the story. On most pages, sometimes almost hidden, is a squirrel who shares Benito's quest. 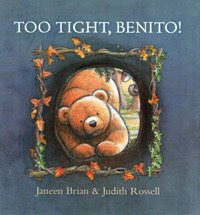 Children will have fun finding him, and enjoy the story's ending where he curls up with Benito in the newly-excavated, "... just-right, not-too-tight Benito Bear cubby-hole ..." Illustrator, Judith Rossell, provides images that will inspire young readers to dig and wriggle and squirm, just like Benito. Every child I have ever known has loved making play-houses, or forts, or cubbies as we call them in Australia. They will also understand the way Benito's own imagination sends him fleeing from the dark hole, deep in the forest, back to his own safe environment. I've read and reviewed several of Janeen Brian's books - By Jingo!, Elephant Mountain, Oddball, Where does Thursday go? - and admit I have great admiration for this prolific Australian author. She has an obvious delight in language, which she shares with her young readers. In Too Tight, Benito! I love the repetition of "snappity twigs and damp leaves, sky-high trees and swaying shadows." which somehow gets across the very essence of forest, and is so satisfying rhythmically. Too Tight, Benito! is a great resource for children who are studying animal homes. After reading it, kids could discuss how they solve problems, what makes them feel safe, and what's good about sharing. It would make an excellent start to a Teddy Bear's Picnic, too! Why not ask your kids to choose a suitable outdoor space, create invitations for their friends, help you look online for yummy food to prepare, and think of other books about bears to enjoy while you're at the picnic. After lunch, it might be fun to create some new cubby-homes for Benito - but make sure they're not too tight! I love books about bears! Some of my favorites are Jane Hissey's Old Bear and Little Bear's Trousers, Don Freeman's Corduroy, and Nancy White Carlstrom's Jesse Bear, What Will You Wear? This one sounds great too! Thanks. Recent blog:=- Games and Activities for Any Day of the Week! Did you grow up on Pooh Bear, too? He was definitely one of my favourites. Another fantastic review. I love the suggestions for parents at the end of your posts. This book sounds great. It reminds me of Jan Brett's books perhaps, where there is a "secondary" story going on in the borders. Would you say this book reminds you of that? Well, the secondary story isn't in a border so much, more that Judith Rossell adds an element that isn't specifically mentioned by Janeen Brian's actual words. Certainly the squirrel is implied by the words on the last page about the home having room for one more. I think it's a case of the illustrator and author working together very well to deliver a whole package. I haven't actually read Jan Brett's books though I love the look of them, and her site is a great one. Some US books aren't so easy to come by here in Australia. Luckily, we have so many wonderful Aussie authors!